October’s the month of Thanksgiving and we couldn’t be more thankful for all of our volunteers. Without the hundreds of individuals who give thousands of hours of their time each month, VOKRA, quite simply, wouldn’t exist. One of those volunteer is our Volunteer of the Month October – Paul Breland. Paul began volunteering with VOKRA in the spring of 2013 and, since that time, he’s fostered 16 litters, including 15 moms and 67 kittens. Paul started volunteering after being sent a link to a webcam run by a kitten foster for Purrfect Pals in Seattle. After watching him foster a mom and kittens for a while, Paul thought it looked like fun and there was no reason why he couldn’t do it. As a foster of moms plus their kittens, Paul’s main focus is ensuring the kittens grow up to be healthy, friendly and well-trained. If the kittens are around a week old when they arrive, it’s mostly a matter of making sure mom is well-fed and her litter scooped. As the kittens grow, Paul gets them used to being around people and being handled. He watches for any sign of ill health and weighs them frequently to ensure they’re going in the right direction. At around five weeks old Paul helps transition them to eating wet food and using the litterbox. As they near adoption age, he then submits pictures and bios for the website and answers questions when potential adopters come to view them. It’s even more difficult to pick a favourite kitty out of the 82 he’s fostered so far, but Paul must go with Hurricane and Spitfire, two kittens he just adopted from his most recent litter as company for his 10-year-old girl kitty. Outside of family bias, one kitty who stands out is Dusty, adopted by a couple of Paul’s friends earlier this year. He’s a friendly little black floofball who became a little brother to another VOKRA kitty. He helped fill the void of a departed kitty and has become a huge part of their lives. THANK YOU Paul for all the time, effort and love you put into ensuring all the moms and kittens in your care are set up for success! We can’t wait to hear more stories from the next 16 litters! As a volunteer-driven non-profit, we clearly couldn’t do what we do without our extremely dedicated and hard working team of volunteers. Thank you to each and every one of you! VOKRA’s always in need of volunteers and fosters. If you’re interested in volunteering with us visit our website at vokra.ca/volunteer or vokra.ca/fostering. VOKRA’s 2018 AGM is coming up on October 18 and we’re actively recruiting for two new members to join the board as directors at large. A director is fully informed on organizational matters and participates in the board’s deliberations and decisions in matters of policy, finance, programs, personnel and advocacy. They also review the bylaws and policy manual and recommend bylaw changes to the membership; participate in the development of VOKRA’s organizational plan and annual review; and assist in developing and maintaining positive relations among the board, committees, operations management team, volunteers and community to enhance VOKRA’s mission. Directors at large are required to attend monthly VOKRA board meeting, including preparation time to review materials. If you’ve got what it takes and want to learn more email communications@vokra.ca. Anyone can attend our AGM, however in order to vote you need to become a society member. Membership is only $10 and is a great way to show your support for VOKRA. We have asked people to indicate whether or not they will be attending the meeting so we can get a rough idea of the number of people who will show up. People intending to run for Board positions must be present for both the nomination and the acceptance of the nomination. Under BC Society Act bylaws, no proxies are permitted. I began volunteering with VOKRA four years ago as part of the gift card fundraising team. Before this time our cat, Kessey, seemed lonely and we decided to look for a friend for him. One of my co-workers recommended VOKRA to us and, after looking through the available cats, we chose Ziggy (originally known as Littlefoot) in June 2014. Ziggy’s been a great companion for Kessey and has brought so much happiness into our lives. We wanted to find a way to “give back”, and I’ve always loved to fundraise at work, so I began to help with the VOKRA gift card program. My duties with the program include replying to emails from gift card supporters, preparing spreadsheets and submitting the order to our supplier. I also process banking transactions and order cards from other retailers. These duties were made easier because of my work in the finance department with my regular job. When I lived in the Lower Mainland, I would help process the order, mail the cards or have them ready to pick up at the Operations Centre, which was usually done twice a month. Now I’m retired and we live on Vancouver Island so I’m not involved with the physical handling of the cards. Managing the gift card orders was a challenge in the beginning. In my first month we had the Walk for the Kitties event and I thought it would be a good idea to have a 50/50 draw. I remember Charis and I running around selling tickets and then frantically counting all the money so Karen could announce the winner. Shortly after this was our annual Great Grocery Stock-up promotion which turned out to be incredibly hectic – we had more than 70 orders in a two week period. The end result was a profit of $2500 for VOKRA and each year our profit increased due to the amazing support we receive throughout the year. It’s rewarding to know I can do something to make a difference. I’m proud to be part of the entire team of VOKRA volunteers. I’ve never met such a dedicated group of people who care so much for our furry friends. THANK YOU Debbie for all your hard work and dedication to VOKRA! The amount of time and effort you put into helping with the gift card program is truly appreciated. VOKRA is always in need of volunteers, especially in the summer months. If you’re interested in volunteering with us visit our website at vokra.ca/volunteer. 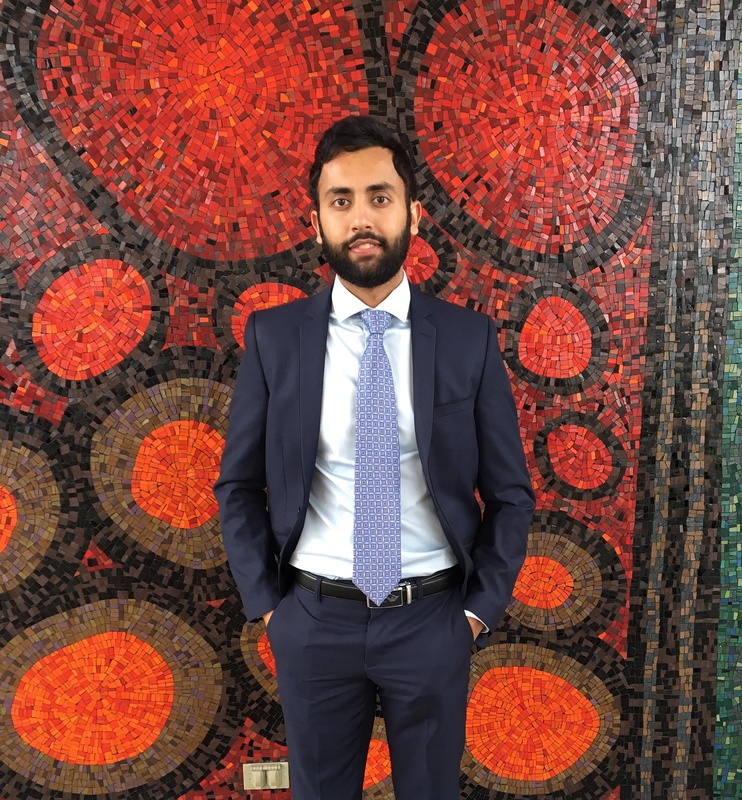 At the beginning of university, I wanted to get involved and volunteer to not only get experience but to meet others and make an impact. With me wanting to pursue a career in medicine the first thing that came to mind was a hospital. I started volunteering there but felt I couldn’t contribute towards anything significant or make any sort of meaningful impact. Thus, I started searching again and stumbled upon VOKRA. I had always loved animals so as I got to learn more about what this organization did and how they achieved it I knew it was the right fit and I wanted to be a part of it. I was also fortunate enough to have gotten the position of recruitment coordinator allowing me to talk to a wide range of individuals. This is undoubtedly my favorite part of being a recruiter as I get to talk to and hear from people of different cultures and backgrounds. I’ve now heard countless stories about how cats or other animals have made a difference in people’s lives which I find to be truly inspiring. All these volunteers and their mutual love of animals and passion for helping is why I believe VOKRA has been able to do such a good job. The fact I get to play a part in introducing them to our organization is instrumental for me and something that always makes me smile. In terms of my role, I started off as a recruitment coordinator and then in conjunction was also the team lead for over two years. I’ve really enjoyed both roles, as a recruiter I’m responsible for screening volunteer applications which involves interviewing volunteers and ultimately placing them in positions that fill our needs, but most importantly makes them happy. As a team lead, I was responsible for coordinating with other team leads to determine volunteer needs, making and refining volunteer positions along with applications, recruiting volunteers via postings and presentations, and finally ensuring our team was a cohesive unit that worked hard to fill all these gaps. Over the years, I’ve formed many memories I believe have shaped me into who I am today. The one that stands out is from last year when Shoaib, one of our recruitment coordinators, and I did a presentation at a senior care home. The purpose of this presentation was to recruit new volunteers. I don’t remember now how many ended up applying but what I do remember is this story of an older lady with her cat. She talked to us at the end about how having her cat was such a huge support network for her when she was severely depressed and without any family or friends. It just goes to show that not only are we helping cats but also indirectly making a positive impact on people. It makes me very proud to be a part of VOKRA when I hear how highly people think of this organization! I am now volunteering as a recruitment coordinator while Michelle leads this team to hopefully become even better and efficient. However, I have learned a tremendous amount in my time here and met many altruistic individuals. I believe these to be a key part of why I got into medical school and something that I’ll always remember now that I embark on this journey! THANK YOU Raj for all your hard work and dedication through the years. We’re so proud you’ve succeeded in being accepted into medical school at UBC and have no doubt you’re going to be a fabulous doctor! This is my third year as a volunteer driver for VOKRA. 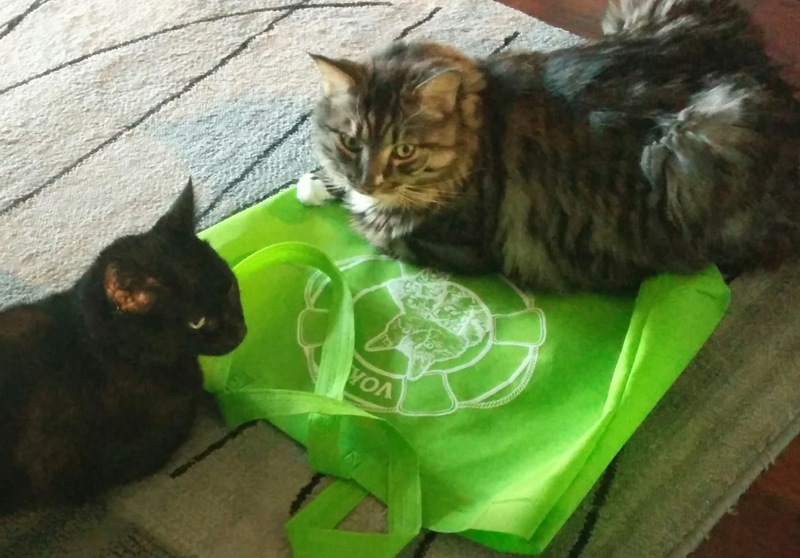 My duties include food and litter deliveries, transporting cats and kittens between the Operations Centre, foster homes and vets, picking up donations and medications, and helping to transport the VOKRA booth to and from special events. 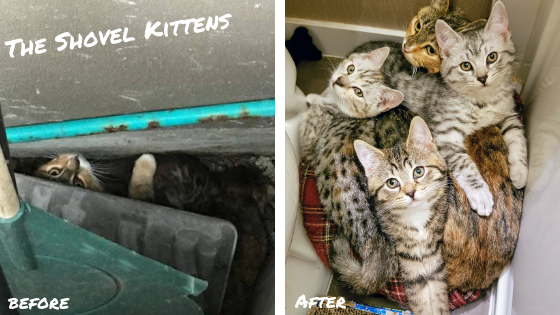 Earlier this year I joined the trapping and recovery team after attending co-founder Maria’s trapping course and I’ve also converted a bedroom in my apartment to a foster home for shy and semi-feral kittens after attending co-founder Karen’s cat care course. 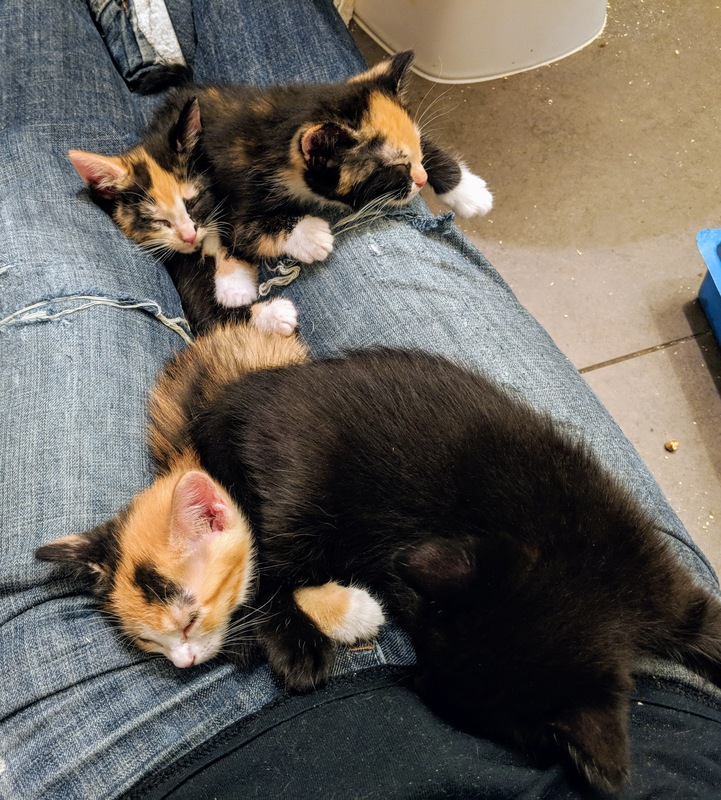 I’ve just successfully socialized my first batch of three kittens that were trapped earlier this year, finding a forever home for one and the other two went into regular foster care. I made videos of the kittens during their socialization and posted them to YouTube for potential adopters to see and to help educate other people interested in fostering shy and semi-feral kittens. I’m looking forward to working with the next batch and will continue to document the process in hopes it helps other socializers or fosters. Additionally, I’m working on joining the I.T. and database team and the video and photography team. I am always looking for ways to help. I’m a veteran and retired computer programmer and I originally joined VOKRA as a meaningful way to keep active and social. I was given a VOKRA flyer, from a friend, 11 years ago when I was wanting a buddy cat for my original resident tabby tom, but I found my Luci and so I didn’t adopt a cat at that time. I did find that flyer again three years ago when I wanted to start volunteering somewhere so I took it as a sign from the universe and applied to volunteer. Since drivers were in most demand, as still is the case today, I eagerly accepted the role and considerate the best use I put my car to. I really enjoy helping all the wonderful people at VOKRA. I’ve never met such a selfless and caring group of people. 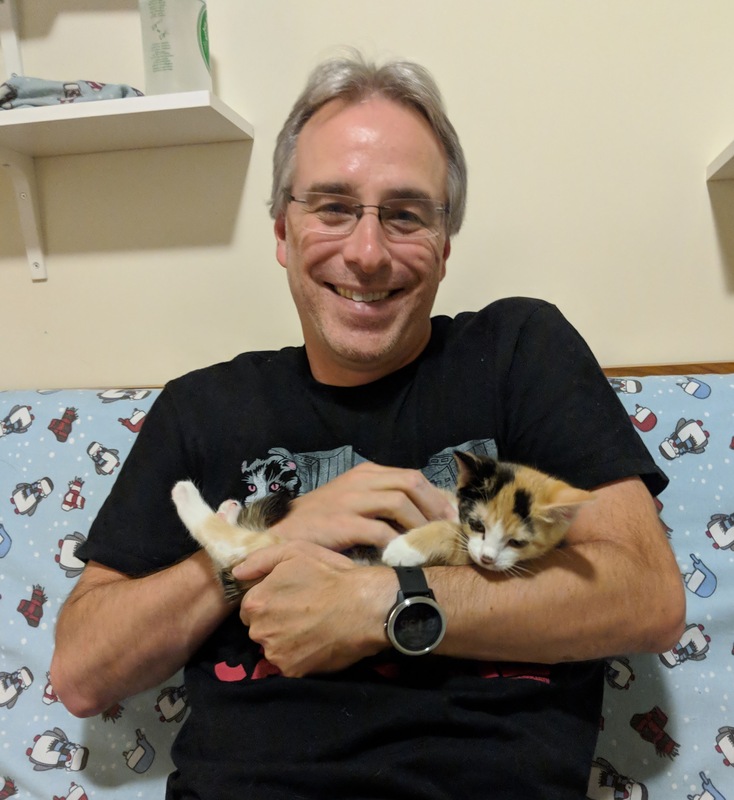 From my experience I found many volunteer jobs have a lot of personal politics and attitudes attached to them, but at VOKRA it really is all about the kittens. From the people at Ops to the foster homes, I think everyone is a real hero and am just happy to help them do their good work. My most moving experience was just this year when I came into the Operations Centre to pick up food and litter for my regular delivery just as four ice cold newborn kittens were rushed in. I just stood in pure awe at the sight of these poor tiny kittens being brought back from the brink of death. Last year I was at the right place at the right time to rescue a cat in my neighborhood who had been abandoned and was starving and in distress. I called Ops and told them about the situation and they said I could bring the cat in if I could catch it. A few neighbors who were worried about the cat helped me get it into a carrier and I brought it right in. He was so thin and dirty and I thought the cat had given up on itself. The next week I came into Ops and the cat was still there but I hardly recognized him. I even asked if that was the same cat I rescued. He was so clean I asked if they bathed him, but no, he had regained his dignity and cleaned himself up. It was so heartwarming to see him take pride in himself. Working at VOKRA fulfills my natural desire to help serve my community (a remnant of my military training no doubt). I don’t really have any favorite cats, but my favorite part of my job is coming into Ops and tickling chins. 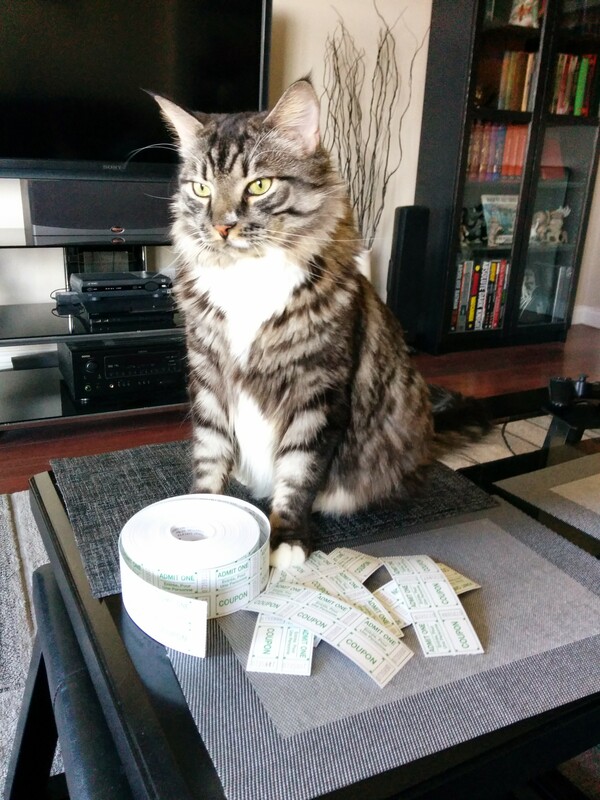 I especially feel honoured when cats tagged with “Caution: Unpredictable” or “Warning: Bites” allow me to give them attention and they don’t live up to their reputation with me. THANK YOU Glenn for your tireless efforts and dedication to the kitties! Your service is truly appreciated! VOKRA is always in need of volunteers, especially as we head into the summer months. If you’re interested in volunteering with us visit our website at vokra.ca/volunteer. This bunch of semi-feral kittens needed lots of socialization before they were ready for adoption. Cats and kittens are ready for adoption when they learn to trust and accept us humans. As many of the cats in our care come from the streets they’ve often had limited or negative experiences with people. By caring for them in a stable and safe home environment, our foster moms and dads are helping to charge their view of humans, which is life changing. Fostering allows these cats and kittens to grow and transform into confident kitties who will then find their forever homes. As each cat or kitten is unique, the way foster parents socialize with them is different. For example, feral or semi-feral kitties see humans as potential predators and so they’ll run away and hide. They may hiss at you when you try to pet them or lash out by swatting or biting. In this situation the caregiver must be slow and patient. You start by sitting wherever they are – close but not too close – and make sure you have some tasty treats. As you have food, they’ll start to associate you with good things. The more they see you as non threatening, the more they’ll warm up to you. Eventually, with patience, love and persistence, an adoptable kitty emerges. Fostering’s not only a positive experience for the kitties, but also the foster parents! It’s very rewarding to help cats and kittens get adopted. A little time and patience goes a very long way and watching them grow and learn to accept and love humans is an extraordinary feeling. Foster parents not only have immense love for kitties, but also the desire to put time and effort into giving them the best life possible. Unconditional love is given to each cat and that love changes their lives for the better. Clawdette’s one of the 26 kittens Erin’s helped save so far by fostering. “My very first foster turned into my very first foster fail! I took her on while living in Australia. I had some extra time on my hands, so I asked the vet clinic close by if they had a sick or higher-needs cat that needed fostering. They were so happy since they just had a feral kitten brought in. She was extremely hissy and completely terrified of humans, so they needed her to go somewhere else aside from the vet clinic. I brought her home and got her settled into the bathroom. After hiding under the sink in the bathroom for the entire first afternoon through to the night, the next day I went in there to stay with her and do my own thing while being with her. After doing that for the morning, she came out from under the sink, crawled up on my lap, had a bath, curled up on my lap and went to sleep. I knew at that moment that I would not be giving her back at all, ever. The rest is history! Sarah, a long-term VOKRA foster parent, has fostered two “pee kitties” so far. These are kitties who pee in inappropriate places for seemingly unknown reasons. 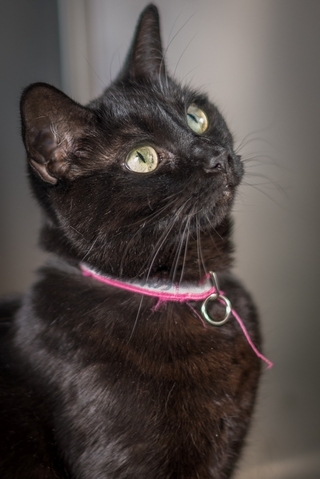 After checking with a vet to make sure there are no underlying medical issues, she goes through all the other potential reasons, such as stress and anxiety, disapproval of the little box shape or litter type, habits or any other thing she can think of. She notes all the occurrences of inappropriate peeing and the surrounding circumstances to find the patterns and modify the environment as needed. She’s just like a detective! 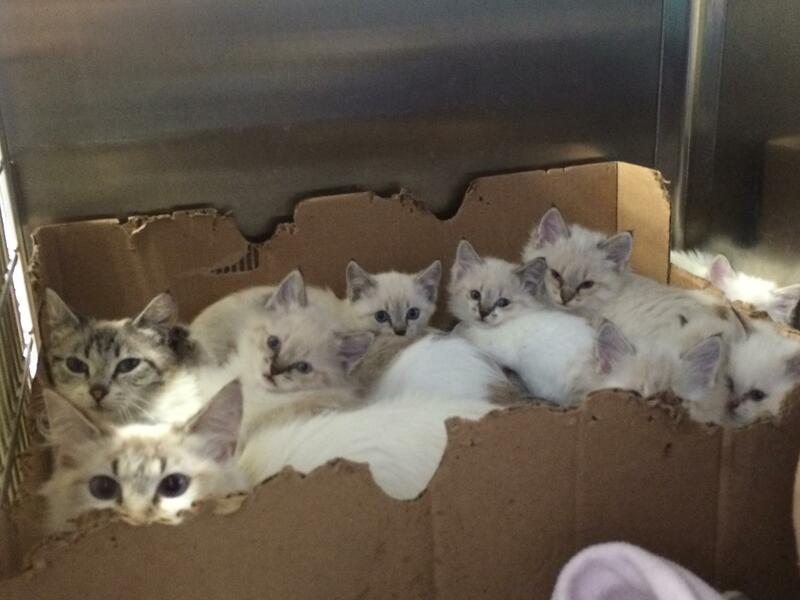 With one foster, all the kitty required was a larger box with deeper litter. With the other kitty, Zoey, all she needed was to have all enticing soft items, such as towels and bath mats, off the floor so the only target for pee was the litter box. All these “pee kitties” simply needed was a person with the patience to understand what they want and the willingness to create a consistent environment for them. Ziggy’s one of Sarah’s former “pee kitties”. Happily she was recently adopted and now has a new forever home. Fostering saves lives and we have more than 350 foster parents to thank for that! 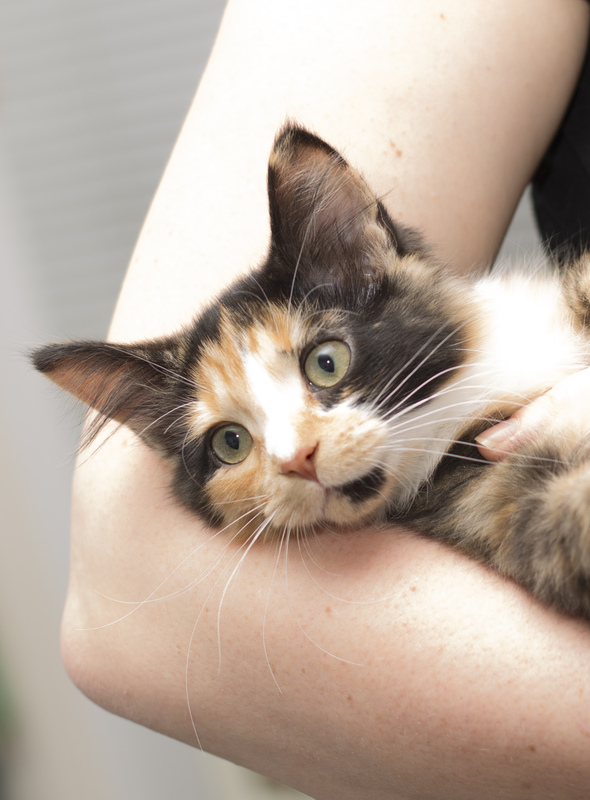 Many of our kitties need to socialize with humans and learn to accept them before being adopted and our foster homes offer the best opportunity for them get the fresh start they need. One at a time, fostering produces a transformed, adoptable kitty ready to find a loving furever home! At VOKRA we’re always looking for new foster parents to help save more lives. We provide all the food, supplies and other equipment necessary to our foster homes, as well as ongoing support and advice. You simply provide the care, attention and love. 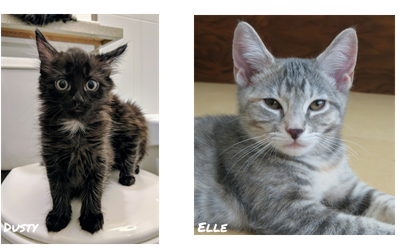 We have a variety of fostering situations as we take in orphaned kittens, feral kittens, pregnant mothers, mothers with kittens and adult cats. Each year we need temporary homes for more than 1,400 kittens and cats! If you’re interested in learning more about fostering, please visit our website at vokra.ca/fostering. Raindrop and Steveston each grew up in difficult circumstances and came to us as semi-feral cats two years ago. They met in foster care where they became fast friends and are a great comfort to each other. 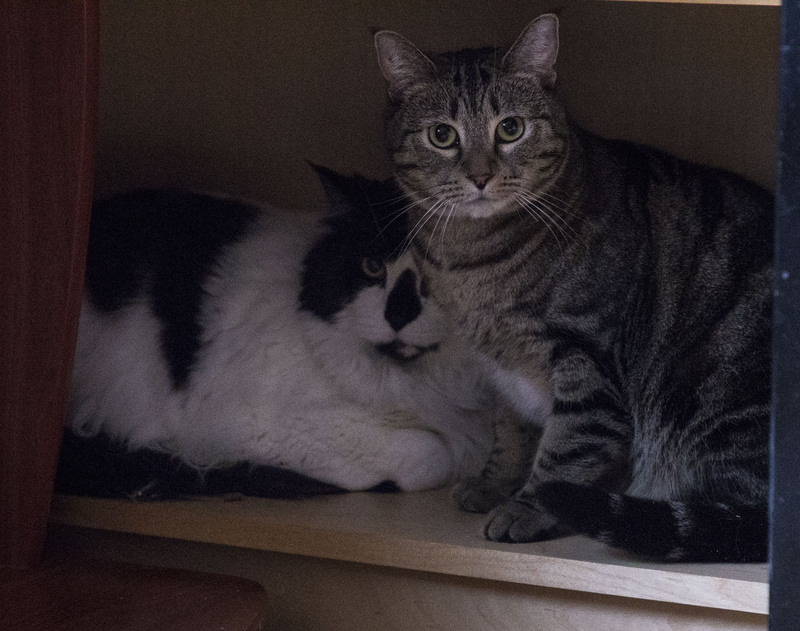 They’re both still very shy, but we’re hoping an accepting and patient adopter will come along and open their heart and home to them. The May sunshine is shining a spotlight on our Volunteer of the Month, Nicole Neifert! 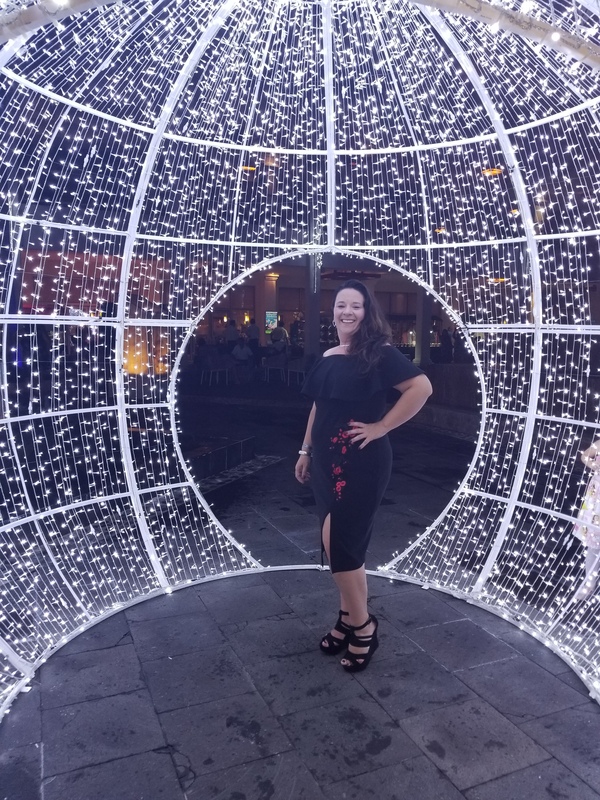 Nicole has been described as “The Original VOKRA Surrey Volunteer”. For more than 10 years she’s spent countless hours helping to get homeless and abandoned cats off the streets. Eventually Nicole built an insulated and heated shed in her backyard to house cats recovering from spays/neuters and a host of other ailments and injuries. Amy, Hans & Itty are just a few of the cats in Nicole’s life. As Nicole has a veterinary background, she’s a natural fit to care for the frailest, injured and sick cats trapped in Surrey. 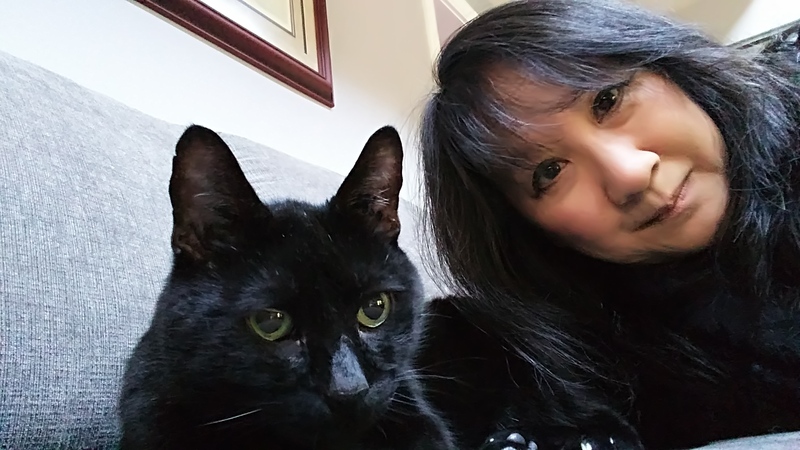 She’s seen miraculous recoveries and a fair share of heartbreak, but over and over again she puts her heart on the line to care for the cats in the greatest need. Although Nicole doesn’t trap much these days, from time-to-time stray cats in need of help find their way to her yard. She’s also quick to respond when there’s a cat in distress – up a tree or caught in a space where they can’t get out. We couldn’t agree more! THANK YOU so much Nicole for your dedication. VOKRA was built through the hard work of volunteers just like you and we can’t thank you enough. If you’re interested in volunteering with us visit our website at vokra.ca/volunteer.